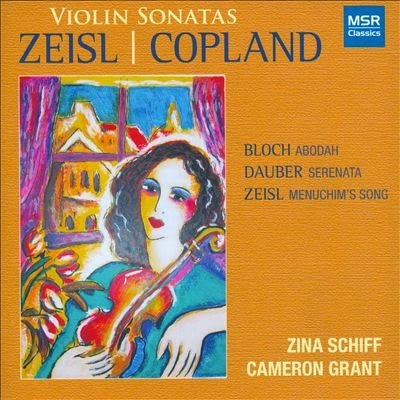 For the last posting on the month, I have at hand an anthology of modern violin-piano music, Zeisl & Copland Violin Sonatas (MSR 1493), played well by violinist Zina Schiff and pianist Cameron Grant. All of this music has in various degrees Jewish "folk elements." That and the rhapsodic dedication of the performers gives this disk a unified feel. On it we hear Eric Zeisl (1905-1959) in his "Violin Sonata 'Brandeis'" (1949-50) plus the brief "Menuchim's Song" (1939); from Aaron Copland (1900-1990) we hear his "Violin Sonata" of 1942-43; Ernest Bloch (1880-1959) gets represented with his "Abodah" (1928); finally, Robert Dauber (1922-1945) closes out the program with his "Serenata" (1942). Copland and Bloch do not need an introduction, since they are of course well-known. Less will be familiar with Eric Zeisl, who had established a burgeoning career as a composer in Vienna before the Nazi onslaught forced his immigration, eventually to Hollywood, in 1941. He composed the soundtrack scores for more than 20 films between 1942 and 1958. He is less remembered for his concert work, but all that may indeed change with the advent of his music sounding so well here. Robert Daucher composed the "Serenata" while yet only 20. He was a Holocaust victim, killed at Dachau in 1945, aged 23. The music is uniformly worthwhile, with Zeisl and Daucher holding their own against their better-known contemporaries. All of the music here is neither rabidly modernist nor exactly neo-classical or neo-romantic. It is music that revels in the "Jewish tinge," soaring minor mode melodies, jaunty dance-inflected music and modern compositional elements, all played with genuine idiomatic musicality by Schiff and Grant. It is refreshing, delightful music that rings true and gives great pleasure. I do recommend this one heartily. Over the years of listening I have embraced Bach's Well-Tempered Clavier ever increasingly as a masterpiece that rewards with an untiring unlocking of its subtleties as you hear it again and again, in all the versions one might come across that approach the music with sincerity and purpose. 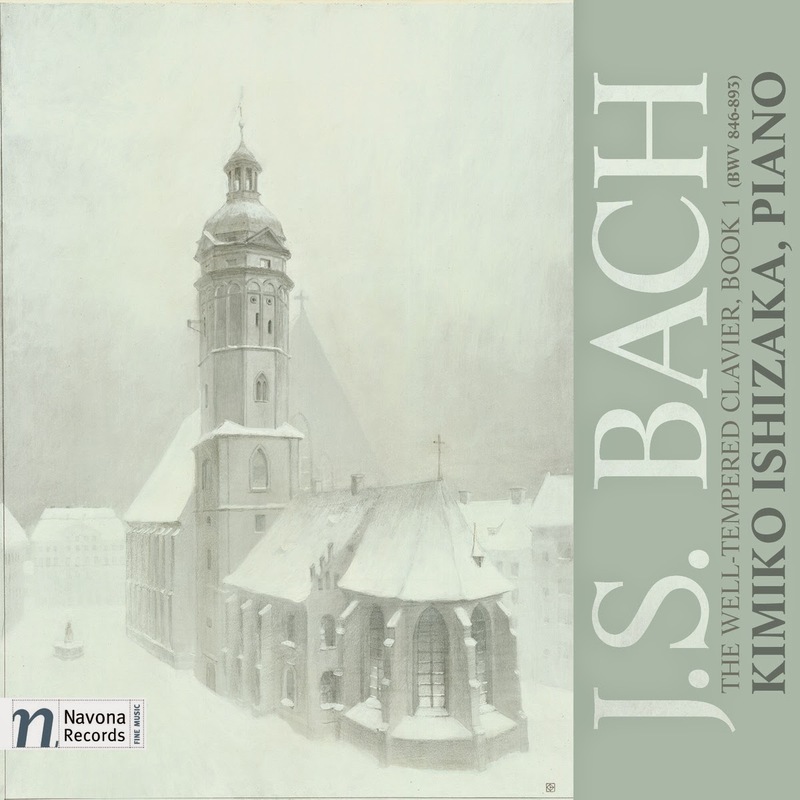 Yet in all the years, all the versions, I have never heard "Book 1" done better than on the new recording by pianist Kimiko Ishizaka (Navona 5993, 2-CDs). She has been celebrated for the "Open Goldberg Variations" which she has made available on CD and for "pay what you choose" download on the net. I have not heard that but after listening to her "Well-Tempered Clavier" I surely will. The main thing here is she has gathered an underswell of public enthusiasm for that rendition that carried over to a funding campaign that made the present recording possible. And I am very glad of it. So what is it that makes Ms. Ishizaka's version so special? She like Glenn Gould does not shy away from the piano's qualities in her reading. Gould made of the "Well-Tempered Clavier" a series of virtuoso pieces that were and still are enthralling to hear, and the piano's sonarity has much to do with the effectiveness of his version. 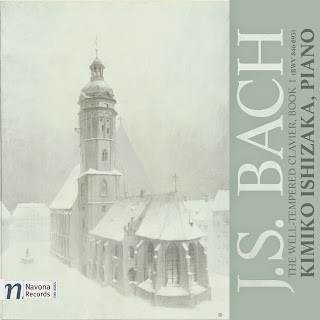 Kimiko Ishizaka takes a different approach, one which is equally pianistic. Yes, she can take things at a rapid clip when that seems warranted. But her singularity of vision is to avoid the sustain pedal completely, more or less staying away also from excessive rubato, only using it when some of the preludes seem to call for it. Otherwise her mission is, in every way possible, to bring out the clarity of each part, to achieve total parity, total equality between parts. This is achieved beautifully by articulation, varying strokes at times to bring a part into increased presence, and a poetic naturalness of phrasing that brings your attention to the whole unfolding. She worked on this in part by practicing each Prelude and Fugue in total darkness, to allow her a total focus on the sound being produced. The results are fabulous. There is a great grace to what she gives us, a marvelous clarity, a sense of totality that is a very real joy to hear. She takes Bach at his word, that each part is important in the ultimate contrapuntal result. You hear Bach with new ears. Her use of dynamics is key, too. She can subtly build dynamically or for that matter play some sections in a more or less pianissimo way. All of it works together to bring you Bach in all his glory. The minor-keyed segments are exceptionally well done, but then so are the major-keyed preludes and fugues. Here we have a poetic reading that respects and brings attention to every note and how it fits into the total scheme of things. There have been other beautiful versions of "Book 1." This is up there with the very best. At the moment it is most certainly my favorite. Bravo, Kimiko Ishizaka! Onwards to "Book 2"! Today we have a release that came out in 2012 but is no less vital for it. 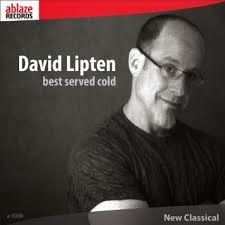 Composer David Lipten is a "classical" modernist very much into structured music of a harmonic depth, music that is not Darmstadt-oriented so much as informed by the pointillism of that school but firmly sequential in a Western modern way. The album at hand is an anthology of various Lipten works entitled Best Served Cold (Ablaze 00006). It sports very good performances from the likes of the Ciompi Quartet, pianist Mark Tollefsen, the Volti choral group under Robert Geary, a small chamber group under Harvey Sollberger, and the trio of Jana Starling, clarinet, Omri Shimron, piano, and Beth Ilana Schneider, violin. Each ensemble-performer does well in bringing us the full impact of Lipten's approach. All in all there is a modern expressive lyricism and a gestural dramatic quality to the music. "Time's Dream" (2003), a choral work in six parts, is especially so. The solo piano work "Show of Hands" (2003-2005) (in three parts) is dynamic and impactful. "Whorl" (2002) for clarinet, piano and violin has depth and an emphatic presence. "Gyre" (1995-97) for six instruments has a dynamic stridency that makes effective interlocking use of reeds, flute, strings, piano and percussion. It sounds very much like the sort of music one expects to hear from the later 20th century, but has an impact born of inspiration and real craftsmanship. "Ictus" (2000-2001) for string quartet works with certain intervals as a germinating cellular theme and goes on for some excellent four-way development. David Lipten, it is clear, is a composer with a strong sense of direction, a fluid syntax and an inventive linear-abstract melodic gift. This anthology will appeal to the confirmed modernist. It is excellently done and very uplifting. Highly recommended. Beethoven wrote his music for pianoforte and cello in an age when the piano sounded very different than it does today. That has not stopped us from appreciating his cello-piano sonatas and variations as played on modern instruments. In the right hands they never fail to enchant. Yet an original instrument experience of the music, it turns out, is rather different, though no less enchanting. 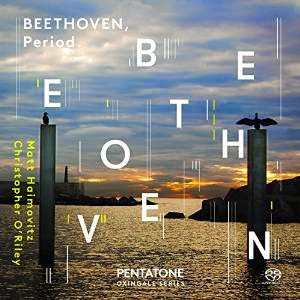 Matt Haimovitz & Christopher O'Riley, cello and piano, respectively, have given us a most pleasant surprise in their complete recording of the complete Beethoven oeuvre for cello and piano on such period instruments, in a 2-CD set entitled Beethoven, Period. (Pentatone Oxingale Series 5186 475). They utilize vintage instruments, tune to A=430 in keeping with various tunings of the era, and use the untempered tunings, all of which gives the music a decidedly different cast. The music has a resonant sweetness with the tuning, sounds startlingly different in key modulations and, because of the lower general volume levels of the piano in those days, gives the cello part a prominence and an overall transparency of parts you don't get in modern instrument versions. The result is a very balanced interplay between the instruments and a very different feel in both forte and pianissimo passages. Listen to the resplendent Cello Sonata in A Major, op. 69, for example, and you will hear the music differently than what we have become accustomed to. Haimovitz & O'Riley seem very at home in with the old resonances. Indeed their performances are detailed and filled with brio in the very best ways. They succeed capitally. Yet it all comes across in a wonderfully refreshing way. This will be delightfully fascinating for all who know the music. It gives us a different sort of lyric appreciation of the music, a new life born of a return to the period sound. Composer Andrew Rudin came to my attention, and no doubt to quite a few others, with his full-scale electronic work Trageodia, which came out on Nonesuch in the heyday of that label's modernist period, in the late '60s-early '70s. Some later works appeared in a couple of Innova anthologies recently (see the July 29, 2011 and December 15, 2011 review articles on this blog) but other than that I have not had the pleasure of hearing more of his music. That changes with a new CD devoted to his Three String Sonatas (Centaur 3266) just out. We are treated to his "Sonata for Violincello and Piano," his "Sonata for Viola and Piano" and his "Sonata for Violin and Piano." The performances are expressive, declamatory and atmospheric, with Samuel Migill, cello and Beth Levin, piano; Brett Deubner, viola and Marcantonio Barone, piano; Miranda Cuckson, violin and Steven Beck, piano, respectively taking on the three sonatas with dash and sensitivity. 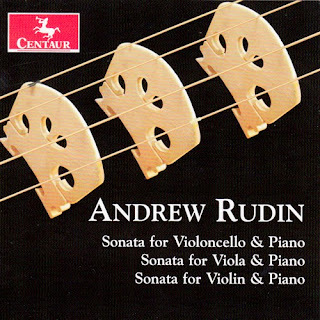 Rudin's three works have a modern harmonic wideness and a rhapsodic expressionism that shades into a reflective, contemplative mode in the slow sections, but also can be rhythmically vital in contrasting passages. The Violin Sonata is the more extroverted of the three but also participates at times in a rhapsodic lyricism. A brittle lyricism generally prevails. The three works fit well together. They establish Rudin as a chamber composer who goes down his own path, with a modernist originality that has something of the Bergian, Bartokian tradition yet remains very much Rudin. These are impressive performances of three heretofore unknown gems. I recommend that all new music stalwarts hear them. The Sixteen under Harry Christophers has created an impeccable track record for early music performance, with a small choir and original instruments, spirit and authenticity as a kind of gold standard from which they do not waver. 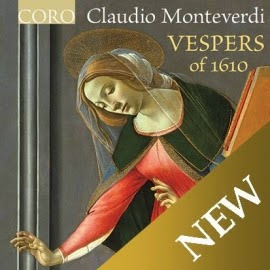 So when they perform Claudio Monteverdi's Vespers of 1610 (Coro 16126 2-CDs), a masterpiece in early sacred repertoire, you expect something worthwhile. And indeed that is what you get. The "Vespers" was a kind of unified portfolio of compositions for the Vespers service, designed to gain Monteverdi the job of Choirmaster at the Basilica of St. Mark, Venice. The music impressed to the point where he in fact did get the nod for the position, but of course they stand out as an outstanding body of work that when performed in their entirety (something that may not have happened frequently in his day, if at all, since the music called for various choral and instrumental resources not always on hand.) give us all the inventive glory of Monteverdi at his best. The Sixteen most definitely excel on this recording. The choir, soloists and instrumentalists succeed in giving us a definitive performance, one of the very best out there. Everything sounds quite striking and energized, and the great variety of settings keeps the ears gloriously busy for the duration. Christophers tunes singers and instruments to 17th-century meantone temperament throughout, which was an untempered standard of the era--but with modern musics would sound decidedly off if the music modulated upward. With Monteverdi the music was meant to sound well with the pure intervallic structure. This as Christophers notes in the liners gives us "a much enhanced resonance in both choir and orchestra, with all major chords performed with pure thirds." This in part accounts for the "sweetness" we hear palpably on the recording. As a fascinating bonus on disk two, the Sixteen give us two versions of the concluding "Magnificat," the "Low" version indicated in the part books which involve a transposition down a fourth, and a "high" version where the movement stays with a non-transposed tonality. I find both convincing. Nevertheless it is the sort of detail Christophers attends to, an example of attention to period performance practice (along with the untempered tuning) that gives us a real window onto how the music was meant to be sounded then. In the end we have a marvelous experience of Monteverdi and his brilliance on this recording. I came out of close repeated listenings with an even greater appreciation of his art, the virtuosity and inventive genius so well displayed here, thanks to this beautiful, enthusiastic yet measured rendition. When the term "third stream" was coined in the later '50s, the convergence of modern classical and modern jazz was something of a novelty. (Though of course Duke Ellington was for years doing wonderful music that sometimes brought classical elements into his composing palette. And then there was Charles Mingus, too, in full-flower.) While the term fell out of use and the somewhat self-conscious movement that the term denoted disappeared as a unified entity, the melding of classical and jazz elements has far from disappeared. Their confluence is no longer considered exceptional, since the synthesis occurs across the stratum of possibilities these days. You can find all kinds of compositional elements in the jazz world that might not have been common 50 years ago. Similarly, improvising within new music realms flourishes, and on the classical side an inclusion of jazz or improvised elements is not uncommon. Mention must be made of the AACM artists and their important contributions from that time forwards. But of course there have been many others as well. A group that has been delving into conjoined utterances for 30 years, the PRISM Quartet of saxophones has been one of the more consistently interesting of the groups who have created dual-style repertoire and encouraged others to follow that muse via their successful example. 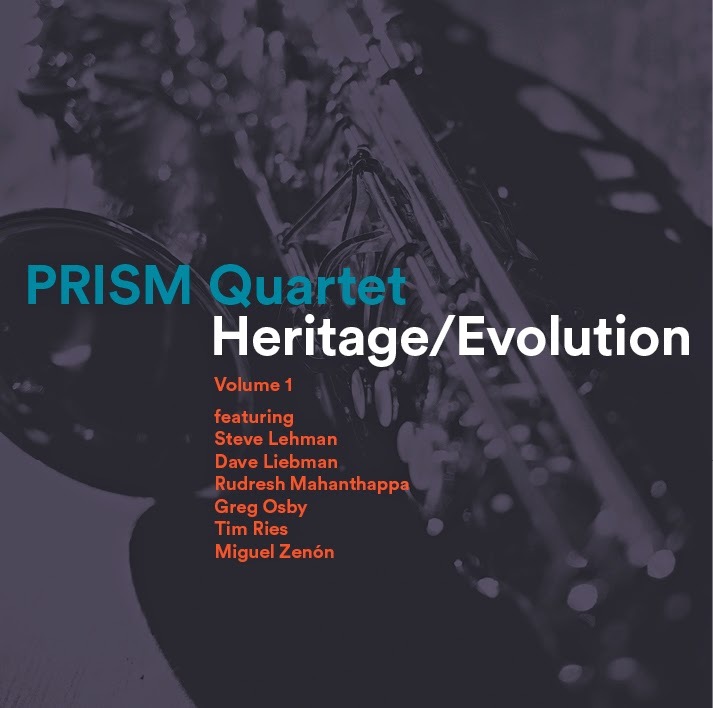 Their latest, Heritage/Evolution, Volume 1 (Innova 906 2-CDs), gives us the staple quartet of McAllister, Shemon, Levy and Sullivan, plus the addition of six saxophonist-composers who contribute both their compositions and their distinctive solo abilities. The results give us a great deal of new music and lively improvising by PRISM and their guests Rudresh Mahanthappa, Miguel Zenon, Tim Ries, Steve Lehman, Greg Osby and Dave Liebman. Ries and Zenon both join the quartet for several compositions as do Osby and Liebman; otherwise the S.O.P. is the quartet and a single guest performer-composer. The two disks comprise a body of new music (plus a nice Liebman arrangement of Coltrane's "Dear Lord") that effectively hammers out a language (or I should say continues to do so, since PRISM has been addressing this for some time) which has modernist leanings both on the jazz and avant classical sides. The saxophone instrumentation and the considerable improvisatory skills of the players and their jazz backgrounds more or less guarantee that the jazz side of the coin is strongly present. Yet the compositions bring in the other elements on the classical side in greater or lesser degrees, and always with the sort of seamless veneer that comes out of a continued immersion in both worlds, either from close listening, from performance, or of course both. Unlike some of early Third Stream works, there is no feeling that "now we emphasize the jazz side, now classical." There is a much more thorough interpenetration that comes out of so many years where there has been both a conscious coexistence and a productive mutual assimilation. I will not run down the specifics of each composition here because probably each is better heard than spoken of at length--and I do not have the space and time at the moment for a description of so many worthy works. Suffice to say that this music convinces, rings true, conjoins the various elements so well that I strongly recommend the set to anyone who finds a serious foray into dualistic stylizations of interest. Or for that matter, anyone who is open to new music. The discovery that the music of Mieczyslaw Weinberg is exceptionally good across the board is one of the revelations of the last decade. It is true of the chamber music as much as the symphonies. That Prokofiev and Shostakovich worked alongside another master composer that we have not until recently had much of a chance to hear is a happy surprise. Of course Weinberg grew up in Poland, a Jew, and only adapted Russia as his homeland when WWII put his life in danger. So we can think of him as Jewish, as Polish, and the music has something of that at times. However we choose to think of him, his mature works most certainly put him in the modern Russian composer camp. The music sounds like it belongs there, even if there are deliberate divergences to be heard now and again in the course of the music's unfolding. Pianist Allison Brewster Franzetti has recorded his Complete Piano Works in four CD-volumes. I covered the Volume 4 program quite favorably last February 27, 2013 on these pages. Now all four volumes are available in a set with slipcase (Grand Piano 698-701) and I have gotten a copy to hear. It is an enormous amount of music. And I am happy to say it is all very worthy of our era and our ears. There are seven mostly exceptional piano sonatas and a sonatina, a good deal of other interesting pieces such as the partita, and a volume devoted to music for children/beginners that is redolent with the Weinberg touch. Allison Brewster Franzetti does a marvelous job bringing out the Weinberg ethos. She seems made for this music. Throughout we get a good deal of Weinberg the modernist. He has a way of creating melody and accompaniment that has on the surface a pseudo-conventional veneer, even a folkish quality, then delightfully veers off course with dissonances, "wrong notes" and bitter-sweet, even sarcastic utterances. In that he resembles Prokofiev and Shostakovich but you would after a good immersion never mistake him for them. He is very original, yet there is something all three composers share. And so I cherish these four volumes, personally. They bring to us a musical world of which we knew little (here in the States, anyway) until now. His piano music is as central as his symphonies. It is a fine thing to be able to hear all of the former, so well played. 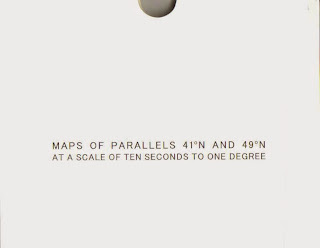 From Portugal's avant label ShhPuma comes a most unusual project, Maps of Parallels 41N and 49N (ShhPuma 013CD) by Helen Mirra and Ernst Karel. It is an electroacoustic-instrumental work that literally turns space into time. It is the offshoot of a film Helen Mirra did abstracting the terrain of a map of the world, translating physical features into colors. For the musical version Helen and Ernst Karel map out the world starting at latitudes 41 degrees N and 49 degrees N. The movement across the surface of the earth is reproduced by sounds within a time scale corresponding proportionately to what one encounters when travelling in a straight line. Land is represented by a guitar motif, railroads by a 16mm film rewind crank, deep water by bass guitar, winds by analog noise generator and filters, and rivers by silences. So in essence we travel the world in sound for 59 minutes. The scale is 10 seconds for every one degree of movement. And the sound essay places us with durations of sound that shift with the terrain, in an absorbingly stark abstract work which reproduces the world in very concrete ways. It is a work that fascinates, mesmerizes, and literally puts you on a journey across our planet. This is not something you would whistle coming home from work. It is in the end a very modern-post-modern essay in sound. In the age before mechanical reproduction made celebrated new works easily obtainable, one was lucky to hear under normal circumstances a new opera or symphony in the live setting. If you were a regular concert goer in a European center you might expect to hear it perhaps only once. After that there were transcriptions made available so that the amateur pianist or chamber group could re-experience the music again in a DIY situation. 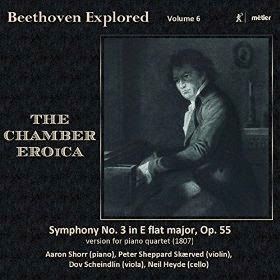 And so for example Beethoven's celebrated and/or then-scandalous "Eroica Symphony," i.e., the "Symphony No. 3," was made available in a transcription for piano quartet in 1807, after its 1803 premiere. We get to experience that transcription as it was meant to be heard on Volume 6 of the Beethoven Explored series, The Chamber Eroica (Metier msvcd 2008). Ironically the populist-oriented chamber version exists now as a kind of relic. The age when you could fairly easily put together a piano quartet from local musicians and dive into the music is long gone. We all grew up in a world where the "Eroica" was readily available on LP and now CD in small towns with a record store, or at the click of a mouse on the internet today. Yet the piano quartet version now gives us different reasons for its hearing. It gives us a very cogently boiled-down version of the classic symphony, yes, but in hearing it we experience the work on entirely different terms, as chamber music. Perhaps surprisingly the music wears its chamber identity quite well. There is of course little left of the hugeness and grand sonoric sweep that a good symphony orchestra brings to the music. But the melodic interplay of the four parts holds forth as convincing in entirely different terms. It sounds less romantic, at times more classical. The brio is there but not the wallop of a large, full orchestra. Part of this has to do with the quality of the transcription, put together then by we-do-not-know-who. The liner notes of the CD make a case for the likelihood that Beethoven himself did it, since it shows such a familiarity with the full score and faithfully choses the essence of the music for chamber presentation. In the end it probably does not matter all that much who did it. The chamber quartet of Peter Sheppard Skaerved on violin, Dov Scheindlin, viola, Neil Heyde, cello, and Aaron Schorr, piano, enter into the spirit of the music with enthusiasm and joy, with style and great grace. They give to the music all the Beethovenesque stylings one could ask for, so that suddenly we see the parallels between this chamber "Eroica" and something like the "Ghost" Trio. Listen to the funeral movement for example and you hear something quite a bit more intimate but moving still. And when you consider that music lovers of the era probably heard this version as much or more than the symphonic rendition, it does make you pause. I for one find this recording enlightening and quite a joy to hear. That should hold true for anyone who has valued the "Eroica" over the years and is ready for a different take on it. Bravo! Ever since Rodrigo composed the iconic "Concierto de Aranjuez," the concerto for guitar and orchestra has been a kind of institution. 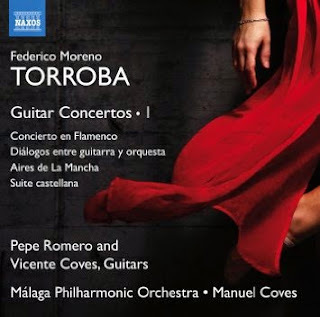 Perhaps no Spanish composer following Rodrigo has been as prolific and productive as Federico Moreno Torroba (1891-1982) in this mode--so much so that Naxos has produced a first disk featuring Torroba's concertos as Guitar Concertos I (Naxos 8.573255) and plans to release two more. The recording thrives with the presence of guitar soloist legend Pepe Romero for half the program and the lesser known but brilliant Vicente Coves for the other half. The Malaga Philharmonic Orchestra under Manuel Coves provides the orchestral accompaniment with an atmospheric flourish. Four works are presented in the first volume. The "Concierto en Flamenco" (1962) is an auspicious beginning, with a wonderful rendition of the flamenco solo part as originally realized by Sabicus. Pepe Romero plays beautifully, the orchestra sounds enchanted, and the music is ravishing. This performance alone would recommend the disk. But of course there is more. There are the "Dialogos entre guitarra y orquesta" (1977) and the early "Suite castellana" from around 1920, both featuring the very capable Vicente Coves, and the "Aires de La Mancha" (1966) with Romero again in the solo role. All these works give us the Spanish traditional sound, beautiful guitar work, and a sort of impressionist transparency in the orchestrations that weave a magical spell on the listener. They are works of real stature, played in ways that entrance and delight. It is a beautiful beginning to the series and I commend the album to you in the strongest possible terms. Oye! Igor Stravinsky has been gone from us since 1971. In the overall scheme of things that doesn't seem that long ago. Measured by our own lives, it is some time. But measured by the history of music it was only yesterday. His music still sounds as masterful as ever. 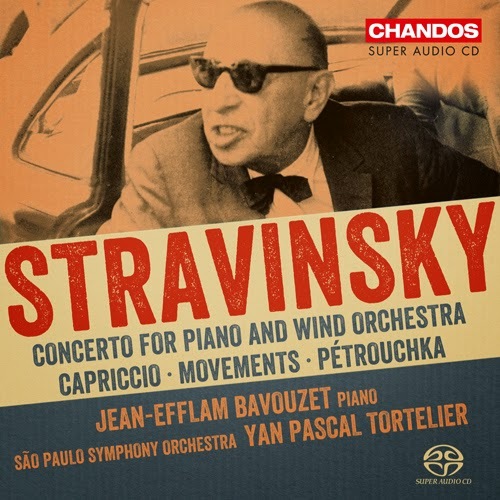 You can hear that especially in the new recording of Stravinsky's works for piano and orchestra, as played rather spectacularly by pianist Jean-Efflam Bavouzet and the Sao Paulo Symphony Orchestra under Yan Pascal Tortelier. What's especially nice about Concerto for Piano and Wind Orchestra, etc. (Chandos CHSA 5147) is that as a SA-CD it can be played on a conventional CD player for great sound, or as a multi-channel playback on an SA capable player. The other very nice thing is that it brings together pretty much all the music of note by Stravinsky for piano and orchestra. So we get the "Concerto for Piano and Wind Orchestra" (1923-24) in its 1950 revision, the "Capriccio for Piano and Orchestra" (1928-29) in its 1949 revision, the 12-tone "Movements for Piano and Orchestra" (1958-59), and "Petrouchka" (1910-11) in its 1946 revision. "Petrouchka" is not a concerto per se of course but it has an important piano part. And so we have some of Stravinsky's best works from a wide period and pretty much covering all his stylistic shifts. Moreover they are masterpieces, each and all. Bavouzet gives us definitive readings, playing with great spirit and zest. The Sao Paulo Orchestra under Tortelier respond with exacting precision and interpretive fire. It's as if the time between Stravinsky's 1971 departure and now has allowed us all to assimilate his complexities and take them on as "our own" music. Bavouzet, Tortelier and the Sao Paulistas play this music with the surety of absolute comprehension and ease. This is the music of our time now. Just as Beethoven was more or less fully assimilated into the musical stream 50 years after he was gone, our time has done the same for Stravinsky. That feeling is energized by the superlative quality of these performances. It is surely a blockbuster album. Superb! 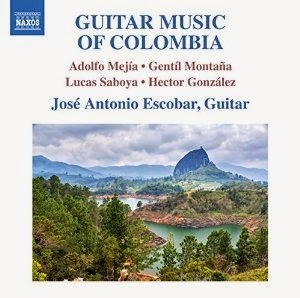 The tradition of vibrant Latin American guitar work thrives in Colombia, as can be heard in the rewarding new anthology by guitarist Jose Antonio Escobar. Guitar Music of Colombia (Naxos 8.573059) presents us with five works/suites by composers of this and last century. To be sure those Colombians in the know would recognize the composers; we who do not specialize in knowing such things may not, but in any event we are in for a treat. For this is music of great invention, placing virtuoso demands on the guitarist yet giving us the sort of brilliance of the Latin American guitar tradition that plays out with beautiful melodic and rhythmic vitality. Adolfo Mejia (1905-1973) shows that in the brief but intriguing "Bambuco en mi." Gentil Montana (1942-2011) comes through formidably with his "Suite Colombiana" No. 2 and No. 3. The younger generation is represented ably by Lucas Saboya (b. 1980) and the world premiere recording of "Suite Ernestina" while Hector Gonzalez (b. 1961) finishes off the program with his "Preludio." Traditional dance forms and the influences of Spanish colonial, African and Amerindian music combine to make these Colombian works sparkle and stand out as central to the guitar repertoire of our times. Jose Antonio Escobar performs them with poetic grace and a fine touch. These are some of the loveliest guitar pieces you've never heard. But even if you have, Maestro Escobar gives them definitive treatment. Guitar Music of Colombia is a winner, hands down. Highly recommended. There is such a wealth of modern Spanish music that I find much of late that I have not experienced before. Joaquin Turina (1882-1949) is a good example. I have gotten to know and love some of his guitar music, but there is so much more. Here we are, for example, with the Naxos complete piano music project, which is up to Volume 10. 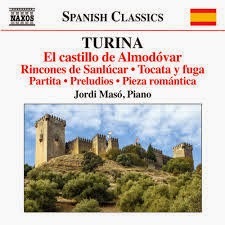 That volume, El castillo de Almodovar (Naxos 8.573183), with Jordi Maso as the capable pianist, has been playing for about a week on my player, and I find myself increasingly under its spell. Turina studied piano under Moritz Moszkowski, composition with d'Indy and later befriended de Falla, Debussy and Ravel. All that fits in with the Volume 10 works, which have some of the classical-romantic precision and uplift of Moszkowski, and are filled with Spanish impressionism not unrelated to the music of the three composer friends. There are six sets of pieces represented in his volume, all written between 1929 and 1933. In it we have those with Spanish-Andalusian folk influences, some with vestiges of expressive romanticism and a healthy dose of impressionism as alluded to above. The most distinctive are those that combine Spanish and impressionist strains. In all we get the title suite (1931) plus "Tocata y Fuga" (1929), "Partita" (1930), "Pieza romantica" (1931), "Rincones de Sanlucar" (1933) and "Preludes" (1933). Jordi Maso gives us fine renditions of the works, with a nice touch and attention to detail. I found the music rather delightful, with nothing in the set that does not have a thematic and dynamic attractiveness. It may not be music to challenge our sensibilities, but that is not what Turina is about. He is a grand synthesist and a lyrical force more than a modernist firebrand. And for that he comes through on this music very well. Most enjoyable! The music of Corey Dargel has such an unusual combination of lyrics, song melody and contrapuntal instrumental accompaniment that it to me occupies a place totally unique. I refer to the Corey Dargel of the album OK, It's Not OK (New Amsterdam). Here we have a collection of 14 songs Dargel composed and sung. They are, for a lack of a term, extraordinarily dysfunctional love songs. The music includes Dargel's synths and drum machine. (I would have prefered actual drums myself, but I know, that is the fashion.) He is joined by four backing musicians on violin, electric and acoustic guitars, electric bass, and additional keys. The music is sung alt rock style without vibrato, definitely not in the operatic category in sound, and that suits the music well. This is art song however, with a poetics in the lyrics and substance in the music. The instrumental parts contain a good number of ostinatos and so there is a minimalist component. Yet they are not the guiding structural element of the music, but rather a post-modern diatonic major melodic feel that can be more or less through-composed on top of ostinatos or winding its way without repetition. The vocal melodies float atop the accompaniment and have no repetitive relation to any ostinatos that may crop up. 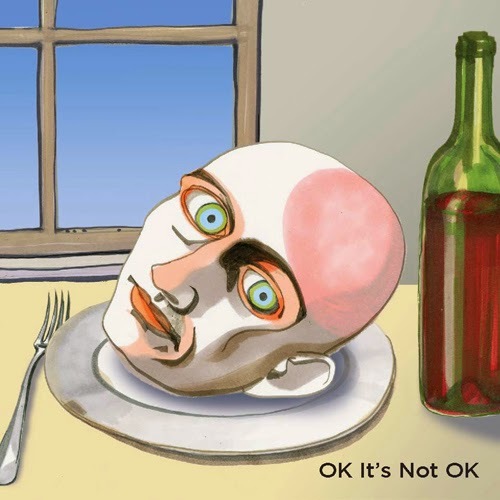 There is a sort of pop-rock-alternative feel that conjoins with the new music postmodernism for a most unusual hybrid. Corey's plaintive voice sings almost cheerful melodies yet there is deep sadness and descriptions of a very alienated mindset, in part because the singer is trying to make it work with a partner who is in some ways just not there for him. "Your anti-depressants make you feel good when you hold my hand," he sings. "Seems like suicide is your only friend. Well, that and your violin," goes another line. Is this jarring combination of lyric diatonics and people who cannot cope akin to the age we live in, where pharmacological products take the edge off of what is a desperate state of mind? Is this the malaise of our time? I don't know about that, but it could be. The odd conglomerate in Dargel's music is stunning, whatever relation it has to statistical density. And in the end this is very personal music, describing in detail a "happy" defeatist despair that determines to smile but deep inside is as miserable as the unresponsive partner sung about. The music is totally original, hauntingly tender and lyrical yet very bleak. It has enough classical-modern poise that I placed the review on this site. This is not really pop. It is too involved. Dargel gives us some breakthrough music that you definitely need to hear. A landmark in its very own way. When done properly performances in the realm of early music bring a time long gone uncannily back into our lives, our present, and make us feel the distance. Ensemble Leones under Marc Lewon do that for us (or for me anyway) on their new CD Argentum et Aurum (Naxos 8.573346). There are composers we may recognize, such as Heinrich Isaac, Guillaume Du Fay and Oswald von Wolkenstein, the latter of whom Ensemble Leones covered in a disk devoted to his songs, The Cosmopolitan, which I covered last May 30, 2014 on these pages. But there is a good representation of lesser-known and anonymous songwriters as well. Common to all the music heard here is its association with the Austrian Habsburg Empire in the early renaissance period. This is music dating from around 1300 through the 1500's, a mix of sacred and secular, classical and folk-like popular music from that region. A product of a good amount of archival research conducted at the University of Vienna, about half of these pieces have never been heard on disk before. Lewon and Ensemble Leones give us authentic original instrument versions of the music, moving performances that capture the aural exoticism and archaic and/or contrapuntal harmonic practices fully. Of course the vocals are done without vibrato. They come off with much elan. What we get is a lovely snapshot of an era and a region in all its musical richness. In the end we sit back and let the music and its often melismatic beauty wash over us. And in the process we get music both earthy and sublime, in ever-varied juxtapositions. The performances are perfectly haunting. I would not hesitate on this one. If you seek something you haven't heard in the early music realm, this one gives it to you in the most moving of terms. Any first exposure to an unfamiliar composer or even an unheard work is a kind of encounter where you open yourself up to whatever may follow. Laws of probability as to style and your own personal temperament then come into play, but the outcome is open. That is what I have been experiencing with the composer Beat Furrer (b. 1954) and his album Chamber Music (Migros CTS M-141) which covers the period of 1991-2011. Furrer is Swiss born but has lived in Austria for some time. He studied with Haubenstock-Ramati before embarking on a career of composing, teaching and conducting. I am not sure how I have missed him thus far but the present volume makes up for it with some music that is most stimulating. The album contains five works that showcase nicely his later chamber music. The works show Furrer as a composer who has digested the lessons of high modernism fully, takes the basic premise of abstraction and sound color into his own generative palette, yet often gives the tones more space between the notes, giving the overall trajectory an ambiance not always a part of the high mod camp. He also can allude to minimalist and post-modern tonality without necessarily being held to the conventions. His music has a wider harmonic expansiveness most of the time and often enough a very open pointillism not typical of those styles. The works are presented chronologically in time, beginning with the 1991 "Aer" for clarinet, cello and piano, and concluding with the 2011 "Studie" for solo piano. In between we get "...cold and calm and moving" (1992) for six chamber players, "Lied" (1993) for violin and piano, and "auf tonernen fussen" (2001) for vocalist and flute. The performances are world class, the music exceptionally well-wrought and original. 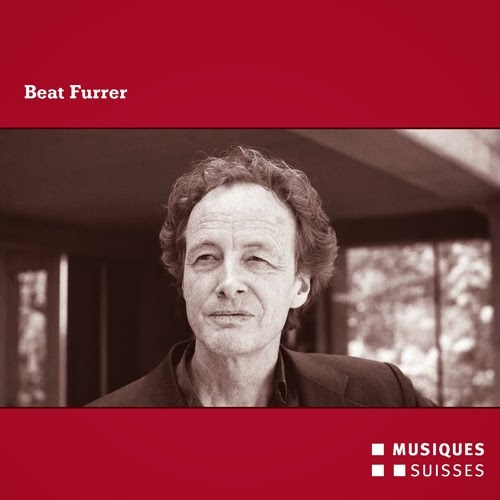 On the basis of this fine album I am now a Beat Furrer enthusiast. He has a mesmeric touch and sense of presence that comes at you at once. Anyone in the modernist corner will surely get much from this release. Don't hold back. Get this one and you will doubtless be glad of it. Yesterday, the in-between Russian composer Liadov was up for discussion, a spanning figure between romanticism and the modern period. Today the Bohemian (Czech) Joseph Suk (1874-1935) gets our attention. He did for Dvorak and the local romantic-nationalists a somewhat similar kind of spanning function in the transition to modernism. His chamber music is some of his finest work and we get a good deal of it in the new recording of the Complete Works for String Quartet (Deutschlandfunk CPO 777 652-2 2-CD), as played by the Minguet Quartet (with the addition of pianist Matthias Kirschnereit for the "Piano Quintet" included in the set). What we get are the full string quartets of op. 11 and op. 31, both lengthy and expansive, plus the op. 8 "Piano Quintet" and a number of single movement works for string quartet, five to be exact. The full quartets are monumental and thematically rich, filled with folk influences and expressive in late romantic terms, bordering at times on chromatic music of an almost modernist sort. They as well as the other works on the program are played quite well by the Minguet ensemble. The music never flags, showing real craft and expression. The shorter works are perhaps less central to our appreciation of Suk, yet they serve to give us a complete picture. The "Piano Quintet" is a somewhat early work but is good to hear. For any who responds to both Dvorak and Janacek, Suk's complete quartets will interest you. The performances are worthy of the music in every way. This is excellent chamber music of the period in any event. Recommended. 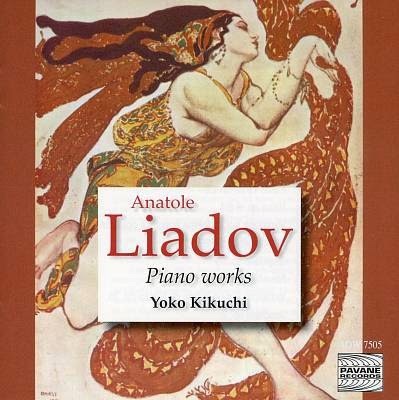 Russian composer Anatole Liadov (1855-1914) was one of those important links between the high romanticism of Tchaikovsky and the budding modernism of the new generation of composers. Prokofiev was his student, which gives you an idea. Yet his output of works produced no certifiable masterpieces. He seemed content in his pivotal teaching role. But of what he did produce, the solo piano works stand out. Yoko Kikuchi gives us a well-chosen sampling of this on her album Piano Works (Pavane 7505). They are mostly miniatures in a highly lyrical style, as a sort of Russian Grieg, if you will. There are 14 of these, plus two longer sets of variations, "sur un theme populaire polonais op. 51" and "sur un theme de Glinka op. 35." There are no tossed off, filler works here. Virtually all are inventive beauties that soar beyond romantic sentiment into an almost impressionist lucidity. Yoko Kikuchi plays these pieces like she was born to them. There is a tender sort of playfulness and just the right rubato when called for, all played with a wonderful touch. Why have I never heard this music, all of it? I am sure there were recordings put out (I do think I have LPs with a few pieces here and there) but I missed anything as seminal as this collection. And I do think its true to say that the music was waiting for a Yoko Kikuchi to come along and do it full justice. She is marvelous. I cannot imagine a more sympathetic interpretation. It makes Liadov not just one of the in-between Russian composers, but for these works a substantial one. These performances will warm you inside. All Russophiles will celebrate the recording I imagine. And those who love lyricism will naturally respond as well. Smashing!